Carpet Reducer/Baby Threshold is used for transitions between carpet and hard-surface flooring. The durable finish coordinates with our real wood and cork flooring. Use with these Millstead floors: Handscraped Maple Chocolate 3/8 in. thick click floors, 1/2 in. engineered floors and 3/4 in. solid floors. 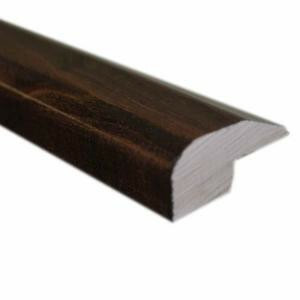 This molding is proudly crafted in the USA from wood grown and responsibly harvested in the USA. Attach moldings to wood sub floors using countersunk nails and finish with putty. Adhere moldings to concrete sub floors using construction adhesive. Buy online Handscraped Maple Chocolate 0.88 in. Thick x 2 in. Wide x 78 in. Length Carpet Reducer/Baby Threshold Molding LM6224, leave review and share Your friends.